50 one-of-a-kind presets for ambient soundscapes, sound design and creative mixing. 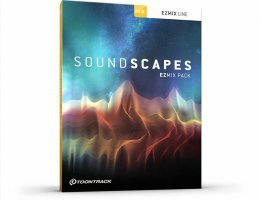 While this EZmix pack is called Soundscapes, it might just as well have been Sound Escapes, because that is what it allows you to do: escape the traditional boundaries of composition and allow your creative self to run free, painting with effects, space and time to create all-new landscapes of sound. The Soundscapes EZmix Pack comes with 50 signal chain presets. It was designed to cater to any creative context that calls for an unorthodox effect, a dwindling echo, a soaring reverb or a richly textured tone – perfect for scores, music beds or any pop, rock or modern audio scene in need of some out-of-the-box ideas. These presets can be applied to any audio source and, quite frankly, should. The canvas is blank and yours to fill. Start mixing! This product requires EZmix 2. EZmix 2 is available for purchase here, at the DonCrack Store.